Do NOT get me wrong. Every mom is a “real” mom, and no car or wardrobe or employment status changes that one way or another. I was no more a real mom when I stayed home than when I worked full-time. And I was no more a real mom when I drove a small SUV than when I drove a sporty sedan. But for a while, I was so unsure of who I was that I looked everywhere for explanations and validation. The most recent reboot of the Spider-Man story skips straight past the superhero’s origins and settles into the time this teenaged boy needs to get used to his new powers — and, of course, the responsibility that comes with them. In a misguided attempt to be just like his hero, Iron Man, he causes some major damage and gets, basically, called on the carpet by Tony Stark himself. 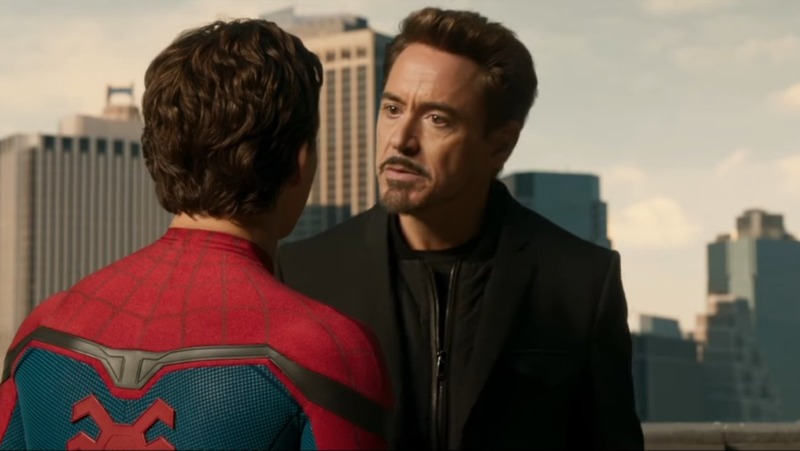 Tony had engineered Peter’s fancy Spidey suit and, like a parent doling out consequences to his son who wrecked the family car, he says he’s going to need the suit back. Peter is crushed, crying, “But I’m nothing without this suit!” Tony is not having it. I saw this movie last summer and haven’t been able to shake that line in the months since. Tony’s point was that the person you are under all the parts of a superhero persona is infinitely more important than superpowers and a super suit, than accolades and celebrity. Who you are is more important than what you wear, what you drive, or even what you do. I come back to this scene frequently and think about how often I’ve felt like a fraud. How often I’ve feared that, any moment now, someone is surely going to reveal me — as less-than, as not-good-enough, as an impostor. And how often, then, have I sought assurance from the suits and tools and labels and stereotypes that I think turn a person into something special? Often. When I feel insecure about who I am, about where I belong, I so often reach for the trappings of a role rather than the Truth of God’s word. I feel like a failure as a parent, so I tell myself I’ll be a “real” mom by reading one more bedtime story, by sticking a love note in a lunch bag, by taking a trip to the park or the zoo or the moon. I doubt my skills and my calling as a writer, so I buy another journal, another set of jewel-toned gel pens, another course on headlines or storytelling or branding. I stumble and sin, again, and wish I could be “a good Christian,” so I sign up for another Bible study, join another committee at church, and change all my presets to the Christian radio station. As I dive deeper into stereotypes and further away from Scripture, where God tells me exactly who I am and where I belong, I start to spiral. Because if being “real” requires me to check a bunch of boxes, to meet a list of criteria? I am out of luck. I will never be able to do everything the world demands of any role. I will never live up to those expectations. But it’s not about what we do, what we drive, or what we wear. It’s not about the suit. Messy buns and Target runs don’t make me a “real” mom. Coffee mugs and a MacBook don’t make me a “real” writer. And there’s nothing I can do or buy or build or wear that will make me more holy or a more “real” Christian. Jesus already did that for me. And He already did that for you. By taking on our sin and the consequences that came with it, He checked all the boxes, met all the requirements, and destroyed every single stereotype and assumption of what could possibly make a person holy, what could make a believer real. Only one thing is necessary for us to be real, and that is being known and loved and forgiven by God. We don’t have to work harder to be “real” moms or writers or runners or bakers or artists or wives or believers. We don’t have to hide behind a mask or a suit or sleight of hand, behind tasks and to-do lists and titles and trophies. We don’t need accessories or embellishments; we don’t need anything to be real. We simply need to rest in the knowledge that who we are is what matters, that what’s underneath is where our value is found. And who we are? What’s underneath? Well, friends, we are beloved daughters of the most high King, paid for by the blood of Jesus. We are perfect and holy, through our salvation, and not lacking anything at all. This work of becoming real? It is, as Jesus said, finished. We are loved. We are forgiven. We are His. It’s only taken me a lifetime to discover what you’ve written so beautifully about. I was a young professional; then a stay at home mom; then a preschool teacher; then thanks to multiple surgeries, a basic “nothing”; a writer; the President of a non-profit ministry…..who knows what special powers I’ll try on next? But, you are so right – what we are at our core is WHO WE ARE IN CHRIST. This is our identity….no other trappings needed. Wouldn’t it be great if when asked, “What do you do?” We could all reply, “I’m a daughter of the King! !” Period. Great post! ps. Own the road in your SUV lol! I LOVE this, but I have to confess that when mini-vans first became “a thing” they looked like toasters on wheels, and I vowed that I would never (NEVER!) drive one of those things. That was before I had kids, and I’ve lost count of how many we’ve bought, destroyed with scattered French fries, and then sold. Your words have inspired me to look at all the hats I wear in this life and to ask myself what props I might be depending on instead of basing my identity upon the reality of God’s calling. P.S. Have you ever thought about becoming a movie critic? This was a special blessing for me this morning. I grew up always being compared to others, never accepted and always believing I just didn’t measure up to what I should be. I lived with that lie for a lifetime before Jesus convinced me I could be comfortable in my own skin. Accepted by Jesus! Who could ask for more? This is the most amazing truth that you write! And it is just what is taking so, so long for me to ‘get’. We talk it all the time, but do we believe it? Thank you so much! I need to know I need nothing to make me His child, just like my children can do nothing to make them mine. Loved, forgiven, sealed! Thank you for this . . . Today especially. If we could just grasp Romans 5:8 – “But God demonstrates His own love for us in this; while we were still sinners Christ died for us.” At our weakest, at our dirtiest, our neediest, our most vulnerable, in our state of ‘nakedness’ (nowhere left to hide or turn) THAT’S when Jesus loved us most – when we were suit-less. Oh Loving Father! Cover us with nothing but Your grace and Your suit of armor to withstand! May we be not afraid to discard our many suits and stand for You, free us oh Lord. You talk about having this crisis of identity as a new stay-at-home mom. Unfortunately, this is a crisis that pops up at different stages of life. I retired to care for my parents. They have both passed and I struggle with who I am. What am I supposed to do with my life going forward? Thanks for the post, it put some things in perspective. You are mot alone in this either. I’m the opposite if most here in that I was never able to have children, spent majority of my adult life single and now am in my late 50s. My faith in Christ is real and I’ve had many times throughout my life where I’ve gone through life changing experiences. Been left wondering, who am I and what am I supposed to do going forward now, Lord? I keep finding out that there’s more to me than I ever thought because of God’s creative, loving and redemptive hand on my life. For a person who grew up with “loving indifference” the challenge had always been seeking feedback on my actions, especially as a little kid. Fear of having “nothing under the suit” kept me from experiencing the growth in identity our life in Christ affords us as well as our freedom at His expense. It’s daily yet as well urges me to seek Him, our Beloved, more each day, coming just as I am. Our God is faithful. Lord please help Patrice find her purpose as she enters into this new stage of her life. These words were like medicine for my soul this morning. Thank you for writing them, Mary. AMEN Mary! I needed to hear this reminder today. I am a “Daughter of the King”!! And thanks also Bev and Michele. I love reading the posts and your comments each day. God’s richest blessings to you all. And Happy Resurrection Day. I have a good friend whose favorite motto is “Live in the Moment” and why? Because we have different phases in our lives, different opportunities and different callings along the way. If we embrace the season we are in I think we will find ourselves feeling real in each season. Ecclesiastes 3:1tells us there is a season for every purpose under heaven. That friend, is a widow of two years now, and it was her husband that always told her to live in the moment. She is trying very hard to do that in her new season of life, one she didn’t think she would be in before retirement. But I see her trusting God every day and I see Him strengthening her to live in the moment. I am treated daily to your devotionals and can’t tell you how much I enjoy, and appreciate them. Prayers that your friend may always feel the comfort of the Lord. Mary, I really needed your words this morning. Thank you. Priceless! Thank you for sharing – it’s so refreshing to hear those words “nothing I can do will make me a “real” Christian. Jesus already did that for me”, even though I already know that, it is a much needed reminder….. and I just might be watching Spider-Man tonight. Mary, thank you. I was just praying about this before I read your post. I’ve tried to find my identity in my job, my abilities, etc., but it’s not in these things it’s in Christ. Help me Father to realize it’s about you and your plan not mine. Mary, you definitely “ hit the nail on the head “ with this !! How very much , myself as well as many other women needed this as we tend to think these same thoughts throughout each season of our lives. I will now think of Spider-Man , “ we don’t need the suit “ it’s so easy today for us to get caught up in all of this as we search our purpose each new season. This is powerful and truthful stuff that speaks volumes to me this morning! Grateful today for this and you Mary. Thank you Mary for being so honest about this. I understand completely about how falling into a sense of trying to good at my job and putting on false faces (this is what I call pretending to be good) about everything. I have had such a hard time feeling that I am not accepted for who I am because I don’t seem to fit in with any of the people I work with. They all say they are my friend, but none of them will have anything to do with me outside of work. One of them is my best friend and she knows everything about me and some of my darkest moments. But she wants nothing to do with me outside of work either. I don’t understand what it is about me that no one wants to be around me outside of work. I think it may be because I don’t drink and I don’t do other things that they all do. It really hurts when I want to be a part of the group, but for some reason they don’t want me to be. I also feel so left out even in my own classroom, because now that we have a new person working in here, my teacher includes her more than me. Will I never fit it in??? Regardless of the stage of life we’re in we are real in our own unique way. Mary thank-you for reminding us of that. Thank you for this. The movie quote stuck in my gut… In so many ways. I definitely feel church culture believes and pushes the join another biblestudy or small group or serve serve serve in our walls. It’s so hard to find a community who just wants to know the YOU God made, not try to form you into what they believe is the right real Christian with docterine and rules about acedemic knowledge of God. It misses just knowing God the person who is love and therefore misses knowing me the person who is loved by God just as I am. I’m not a project to be molded by humans. I may see and hear the Lords words different than others, that doesn’t make us any less lovers and followers and friends of Jesus. Just different. Im tired of the must fit a mold. Jesus never did. He just was the great I Am. And I just am the daughter of the king. How do we do better in the current American christian church culture? So many are leaving because they feel like a little kid being scolded by nagging teachers on a high horse when they just want to love and be loved, do everyday mundane life together, have others be willing to hear a different perspective once in a while and realize our God cannot be boxed by our human checklists. That maybe just maybe the one not fitting the mold has something to offer that isn’t wrong…that is actually quite a beautiful living example of God. I LOVE this post, Mary. I suffered some sort of culture shock when I quit my full-time job to become a stay-at-home momma. No more work pressures and running out the door like a mad woman. Things slowed down. Way down. And I didn’t know what I was going to do between loads of laundry, fixing dinner, and kissing boo-boos. Bit by bit, little by little, God has been working on me. Molding me and making me new for every new season. Our daughter is 13 now and I thought (that’s where I get into trouble!) I would be back to work by now. I planned to return to work once she was in the first grade. Haha! But God reminded me just the other day how I wouldn’t be able to do some of the new things He’s calling me to do if I were working full-time. I recently started a small group (part Bible study, part women laughing and encouraging each other) right here in our living room, working around others’ work schedules. If my schedule were also an issue, it would be too difficult to get us all together. Not to mention I am blessed to spend time with my daughter and husband every single day. God helped me to see that I, we, all have a God-given label and it’s absolutely perfect. And there’s no culture shock there! Thank you for a wonderful and encouraging post. God bless! I still need this reminder after half a life-time of being a Christian, more than two decades of being a wife and mother, and 51 years of being a human. Now I may need to check out that Spider man movie. I hear you!! I feel like I’ve lost my identity in many ways. Like you I’ve worn many hats. Full-time employee, student, wife, daughter, caregiver, etc. The last four years saw me as part-time caregiver. I enjoyed visiting my dad & assisting in his care. He passed March 2017. Fortunately God led me to a part-time job before that. There are times I question if I should be working full-time with a good “career/job”. Who am I? What’s my role now? This world screams do & accomplish more. Your identity is in your job/wealth, etc. God says “You are my beloved”. Shine & sparkle with the talents I gave you. God calls us special, loved. We don’t need special talents or a suit. Just be yourself & share God’s love with others. P.S. That was a great movie.–all Marvel movies are great!! I guess I can join the club, for years I wanted to be a writer, I felt like just a baby sitter after high school. I kept trying the real job thing. I hated beauty college. I even tried to get job in a bank, and I’m not great with numbers. Here I am now with a blog and lots of possibilities, just giving Him glory. I even wrote a post called A Real Girl, I was a little envious of an older lady who worked daycare, she had a powder blue Chevy, driving my mother’s car, I just wanted to be a real girl. But you know what, I was! We all have our moments don’t we? Just be a Jesus Girl. I’m not a mom, but I loved this! It made me laugh and think deeply and recall these words of truth. Blessings on you! YES!!!! Love everything about this article! As a child, i was taught that if I just did this or that, then I would be a real Christian and worthy of love. I was never ok just being me. I was ashamed of my humanity because of it. When I believed that doing or being xyz was the only way I would be of value, I was allowing those “things” to get in the way of my relationship with Christ. I was believing in the acts, not the pure salvation. And in doing so, the acts were becoming the idols I worshipped. There is a very fine line in serving and worshipping Christ and, just making it look like I am serving and worshipping. The difference is where I trust. When I put trust in the acts, i no longer trust God. But if I put my trust in God, the acts become me sharing my love of God with others. Certainly identified with your comments. Am thankful for the truth of what you say, Thank you for saying it. YES!!! You hit the nail on the head! How often do I do this?! Such a good Word! Thank you! I got hung on that line too and came to a similar conclusion about believers. If we lean on what it ‘looks like’ to be a christian, instead of relying on what’s happened inside us, then we’ll always come up short. Thanks for the reminder of that great take-away! Thanks so much for sharing your insights here and most importantly that our true identity is in Christ Jesus and the works He has prepared for us to do before the worlds began.